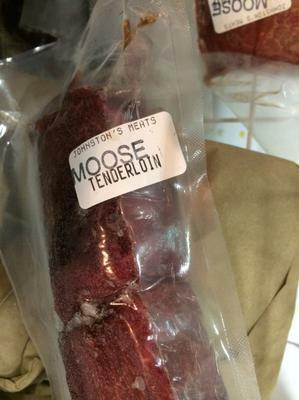 Had someone give me some frozen moose chops and steaks about 7 months ago. Didn't pay attention until yesterday when looking in the freezer for some meat that the packages were dated 2011. My son had gotten several packs shipped to him overnight from Alaska about a year ago. He made some pasta sauce and some chili with the ground and it was ok. I'm guessing all of it was packaged at the same time. This stuff is wrapped really good in butchers paper. I know nothing about moose. What are your suggestions about this? Would you chance eating it or toss out? What should I be looking for as far as smell and color? It would be a shame had I killed the moose. Some one gave the meat to me and I didn't notice the date on the package until recently. If you had paid attention to my original post you would have seen that I said some one had given me the meat. Any game that I kill is eaten within one year. I have a daughter that helps me eat it very quickly. She even sneaks in the freezer some times and takes stuff to her house. A butcher shop asked me once IF I process my own moose meat.... ABSOLUTELY!!! In this process I grade my cuts or chunks into what will be trim and/or steaks. I bag ALL my trim UNTIL I need to grind it (an amount) into burger. I try and rotate my freezers EVERY year...but at times I miss a few packages. I have un-wrapped moose meat FOUR YEARS OLD....!!!! Thanks Mark and Robbie! I took the tape loose and pulled the paper back some. Opened just enough to see a little bit of the meat. It looks dark to me but not burnt. Again, I only opened just a little bit. I've never seen or eaten moose but have had my share of white tailed deer. Thaw half way, with a sharp knife trim off what looks like freezer burn, the lighter color meat. Next cube the meat in 1/2 in cubes, with some oil of your choice, salt and pepper may be a pinch of garlic fry and turn to brown all sides until the centers are still pink, turn down heat put a tin foil tent loosely to keep cooking for several minutes while your potatoes are boiling ,mash the spuds, make gravy with flour and water, stir in the meat and eat don't over cook. If that is your moose meat in the pictures it looks in pretty good shape. I concur with Mark re freezer burn. The key to frozen meat longevity is in the wrapping. I always double wrap with heavy commercial plastic wrap and then freezer paper.. I just pulled out some steaks from 2013 and they were fine. Freezer burned meat is good for sausage..
Well wrapped moose meat will keep for a long time. I don't think you'll suffer any health issues by eating it. 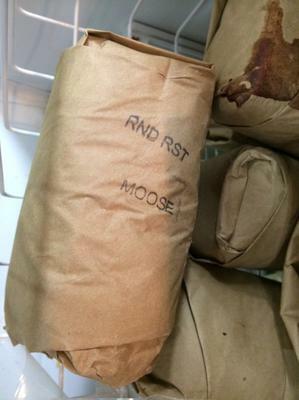 The quality of your moose meat is what is at stake here. Any meat will dehydrate in the freezer, thus the term freezer burn. Freezer burned meat will look cooked when unwrapped and will have a musty odor. Sometimes the freezer burned areas can be trimmed away other times the whole piece will have to be discarded. 2011 is getting up there in age, but I would investigate it before I just chucked it out. Old meat will obviously not be as good in flavor or appearance as fresher moose meat would have. Give it a try and see if you like it.